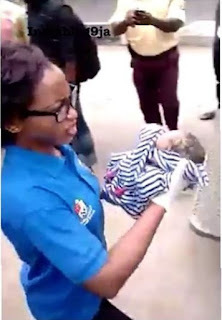 There was jubilation last Friday when a passenger of a BRT bus gave birth miraculously in the bus at Fadeyi Bus-stop, Yaba, Lagos. There was no complication or problem with delivery as everything went smoothly. The mother of new born was thereafter led into an Ambulance as crowd cheered and congratulated her. The video showing the newborn being carried out of the bus into the ambulance broke the internet as a lot of people were very excited.